Educational and easy to learn. Your Very First SET Game! Start playing your favorite game with your kids as early as age 3! SET Junior’s two-sided board is designed to grow with your child. Side 1: Match your tile to a square on the board. Start to recognize SETs while matching the color, number and shape. Side 2: Now that you know what a SET is, it's time to flip the board and have fun racing to find as many SETs as you can! The thicker tile-like cards are easier for little hands and the point chips make scoring fun. SET Junior builds cognitive skills and memory recall at a critical age in a child’s life. It is also proven to help grandparents who are suffering from Dementia and Alzheimer’s. Just like the original SET game, SET Junior was made as a game of fun, but also sharpens your mind as you play. Each tile contains three features, shape (oval, squiggle or diamond), color (red, purple or green) and number (one, two or three). A SET is three cards where each feature, when looked at individually, is either all the same OR all different. Marsha’s ability to disguise learning with fun has endeared her games to many people over the years. She has really outdone herself this time by creating a super-fun kids game that is excellent for developing right-brain left-brain connectivity and increasing cognitive and logical functionality at a critical stage in a child’s development. 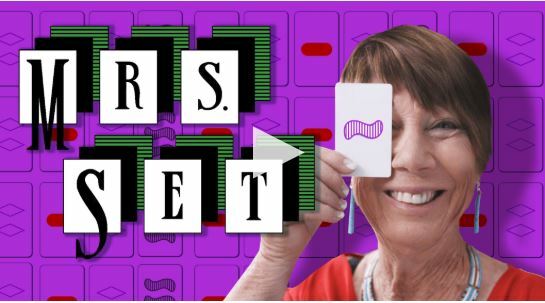 Mama Smith's Blog - SET Games - Game Night for All Ages! ​Don't forget to check out SET Dice!